There are objects that deserve a prominent place in the history of technology, and the Apple I computer is one of them. They were in the mid-70s when the young Jobs and his partner Woniazk brought something big , the genesis of a home computer, and almost unwittingly, the leading technology company. Tomorrow a historical document will be auctioned. It is a handwritten sheet by Steve Jobs himself, detailing the specifications of that computer. It is expected to get a figure close to 60,000 dollars , about 52,900 euros to change. The lot is available for your visit on the home page of the auction house, which you can consult here . The truth is that there is no waste, it is reported that the computer uses the microprocessor 6800 6501 and 6502. If we talk about the RAM that was included, both 8K and 16k, we are practically unable to imagine how that machine could work . A piece of computer history that can be a candy for collectors, especially when Steve Jobs died 7 years ago. The document, which includes the address in Los Altos (California) and Jobs' own telephone, also includes two Polaroid photographs of the computer's motherboard. Say that address corresponded to the address of your adoptive parents . Who would have imagined where that adventure would end up coming! 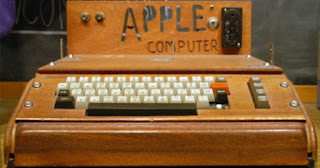 Periodically , computers of the series I and II, as well as any type of material from the first time of Apple, are auctioned . Normally prices close to one million dollars have been reached for well-preserved units and without modifications . The document that goes to auction tomorrow is undoubtedly an element of great interest for collectors.